Don't leave the most valuable trove of user insights untapped! With productboard's newly enhanced Zendesk integration, your support agents can easily share relevant feedback with the product team by pushing select tickets straight to the Insights board. Having these user insights on hand helps product managers during prioritization. It also serves as invaluable context for designers and developers, helping them build the right features in the right way. Note: The Zendesk integration is available for all Zendesk plans except for Support Essential which does not include access to public apps & integrations. Trigger tickets to be pushed to productboard by tag or custom triggers, or automatically push all tickets to productboard. When a ticket is pushed into productboard, any subsequent replies to the ticket will automatically be reflected in productboard. If the associated productboard note has been processed, it will automatically be sent back to the Inbox. To set up the integration, you’ll need to have an admin role in both productboard and Zendesk. 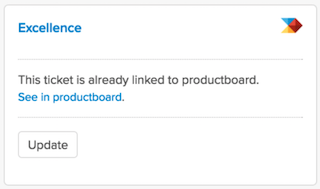 In productboard, under Integrations, add a new Zendesk integration. Choose how you would like to pull conversations to productboard. Looking to further automate the process of sending certain tickets to productboard? Set up custom trigger conditions in Zendesk (e.g. push tickets containing a designated keyword). Toggle the Settings option: Custom trigger condition. Save and Authorize the integration. Go to Zendesk > Admin > Business rules > Triggers. In productboard - trigger settings, under Conditions, replace the placeholder condition with your own custom condition. Only those tickets meeting the conditions you define will be pushed to productboard. To learn more about what types of trigger conditions Zendesk supports, see the Zendesk article Trigger Conditions and Actions. 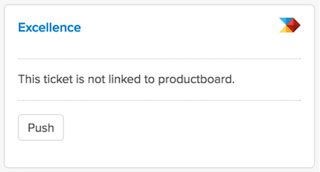 If you'd like Zendesk agents to be able to push tickets to one of several productboard projects, you'll need to authorize Zendesk integration on both productboard projects and define how tickets will be pulled to productboard. If you'd prefer to manually push tickets (as well as subsequent replies to those tickets) to productboard, use the legacy productboard app on the Zendesk App Directory. Upon installing the app, support agents will see a module beside each Zendesk ticket allowing them to push it to productboard. Subsequent replies will only be sent to productboard if an agent selects update. Note: The productboard app for Zendesk only transmits basic data associated with the ticket (customer name/email). Tags will not be synced to productboard. Navigate to the Zendesk App Directory and select the productboard app. Select install and ensure you're adding this app to the correct Zendesk account. Enter the subdomain for your productboard project. The subdomain is the part that comes before .productboard.com in your project URL. In any Zendesk ticket, open the apps sidebar by clicking the Apps button in the top right. You will be prompted to log in to productboard and authorize Zendesk to access your account. Once the productboard app has been installed and authorized by an admin, any Zendesk agent can use the app without the need for a productboard account.